Wrap checked exception into an instance of RuntimeException. The difference between checked and unchecked exceptions only exists during compile time. The potentially thrown checked Exception is hidden from the compiler with the help of Generics. The technique described is inspired by a thread on stackoverflow.com. Although it does not spare you the try-catch-Block. This is addressed by Project Lombok with the Annotation @SneakyThrows. Lately I have migrated a project from JUnit to TestNG. With the help of an Ecplipse plugin this is a one-click task. Every assert-method is replaced by its counterpart in class org.testng.AssertJUnit. This is only an intermediate solution. The final goal is to use org.testng.Assert. This will present a small challenge. JUnit's two arg assert-methods, e.g. assertEquals or assertSame expect order expected, actual. TestNG expect the opposite. Therefore argument order needs to be flipped. 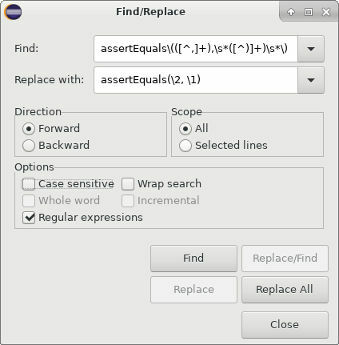 Within the respective test class call the Find/Replace-dialog, either via menu entry Edit or via [Strg]-F.
Enter assertEquals\(([^,]+),\s*([^)]+)\s*\) into text field Find. Enter assertEquals(\2, \1) into text field Replace. The regular expression in text field Find makes use of two capturing groups. Capturing groups are created with ([^,]+) and ([^)]+). They are referenced in text field Replace in reverse order with \2 and \1.